Good Morning! Yep, this is another farewell post. My term with the MyGrafico Challenge blog comes to end with this posting and I must say, it has certainly been a pleasure. To have worked with Martha and the team has been inspiring and so much fun. Here's the sketch portion of this week's challenge. We're using the adorable set Vroom! - way cute. Please be sure to visit the blog for the sketch details because my card is a very loose interpretation of it. 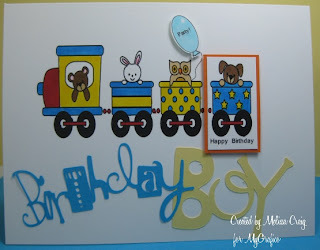 Mary created a wonderful sketch and it was a challenge to make it work with a train. I think I created a very cute little boy's birthday card. The image is from the set Zoom Vroom set by Cocoa Studio. I printed it twice just so I could pop the last car up from the card. I added the Happy Birthday right under the car when I printed it. Then I used a much neglected Cricut to create the Birthday Boy sentiment. I hope you join us this week and don't forget to head on over to the challenge blog to join in the fun and leave the DT some love. As I said, it's been a pleasure. Thanks for stopping by. What a sweet Choo Choo! !